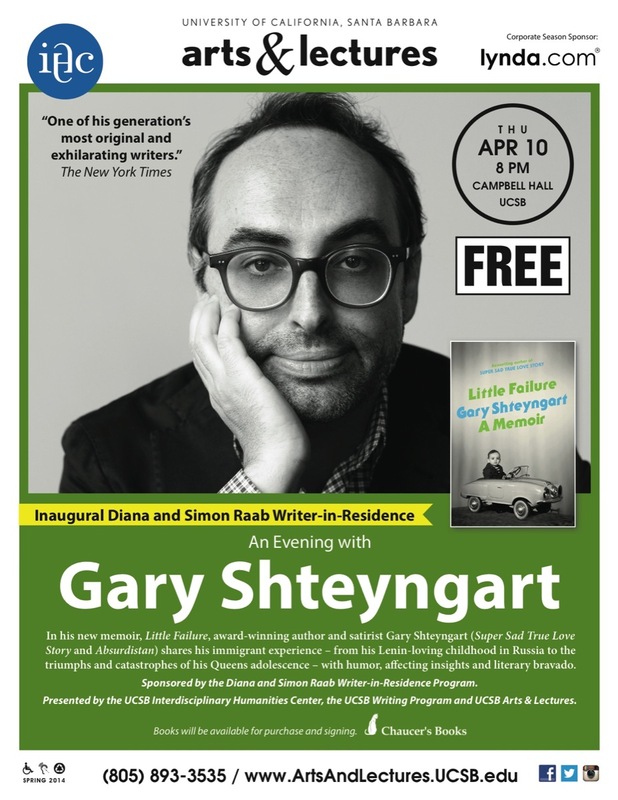 UC Santa Barbara is pleased to welcome Gary Shteyngart as the inaugural Diana and Simon Raab Writer-in-Residence. He will read selections from latest book, Little Failure: A Memoir, which was published in January 2014. Shteyngart was born in Leningrad in 1972 and came to the United States seven years later. He is the author of the novels Super Sad True Love Story, which won the Bollinger Everyman Wodehouse Prize and was selected as one of the best books of the year by more than forty news journals and magazines around the world; Absurdistan, which was chosen as one of the ten best books of the year by The New York Times Book Review and Time magazine; and The Russian Debutante’s Handbook, winner of the Stephen Crane Award for First Fiction and the National Jewish Book Award for Fiction. His work has appeared in The New Yorker, Travel + Leisure, Esquire, GQ, The New York Times Magazine, and many other publications and has been translated into twenty-six languages. Courtesy of Chaucer’s Books, copies of Shteyngart’s books will be available for purchase and signing. Sponsored by the Diana and Simon Raab Writer-in-Residence Program, created to bring distinguished practitioners of the craft of writing to the UCSB community. Co-presented by the Interdisciplinary Humanities Center, the Writing Program, and UCSB Arts and Lectures.